I don't have a strong grasp on exactly how long the clip above runs but I've got a feeling Meyer just might make good use of the extra IG running time. 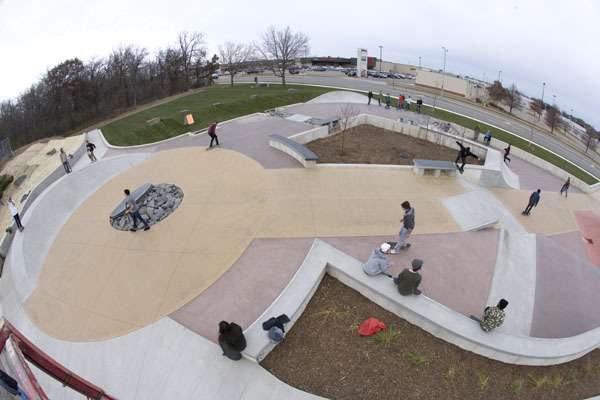 The Burnsville City Council approved the Phase II construction for the Burnsville Lions Skate Park. So the good news is: we have a construction project that will set Burnsville in the skating scene for years to come. The other news that comes with construction is: the entire skate park and surrounding area will be closed during the construction period. Anticipated construction schedule is May 16 - August 16. We are asking for your help in spreading the word to keep skaters out of the area so you have the best possible quality of workmanship and the park holds up for years to come. We will be having a Grand Re-opening celebration once the park is completed. A bit more: The Burnsville council essentially gave the go ahead in January and finalized the bidding process at its April 19 meeting, awarding the work contract to Custom Builders, Inc., on their nearly $234,000 bid. Much of the funding for the expansion comes from the city -- just more than $155,000 comes from its park fund -- while $50,000 was contributed by the Lions Club, hence the name. Max’s father, John Kuker, was a recording legend who owned Seedy Underbelly in Minneapolis and Pachyderm Studios in Cannon Falls, paving the way for local musicians like Semisonic and Jonny Lang to launch their stars. He was also an avid skateboarder, placing Max on his own baby penny cruiser when he was just six years old. Last February, John died unexpectedly of a heart attack. He was 40 years old. Per a text convo with Davis about the news last week, he said that after his two Purple One-themed pro models, "[I] kinda had to tell them no more Prince graphics." The one I held onto is definitely bound for the wall, now. The St. Cloud Skate Plaza needs brighter lights! We have one of the best outdoor skateparks in Minnesota but skating at night can be a bit hard on the eyes and hard on the body making it a bit of a safety concern to some. The current lights are a dull yellow color and we are looking to upgrade to a brighter much more clear LED system. It will cost $4,000 to upgrade the 3 light poles and fixtures already installed at the park. Spring is already here and Summer is on the way, we hope to have this money raised as soon as possible for the warm nights ahead. Any additional money raised that is above our needed goal will be donated to the St. Cloud Skate Plaza for some much needed maintenance. Any and all money raised will be greatly appreciated by not only the locals of the St. Cloud Skate Plaza but by all the people who come from all over the state to ride at this outdoor skateboard park.